What is the Cloud City Multi-stage? The Cloud City Multi-Stage is a 6 stage/7 day, 173 mile/278 km footrace through the Rocky Mountains of Colorado. 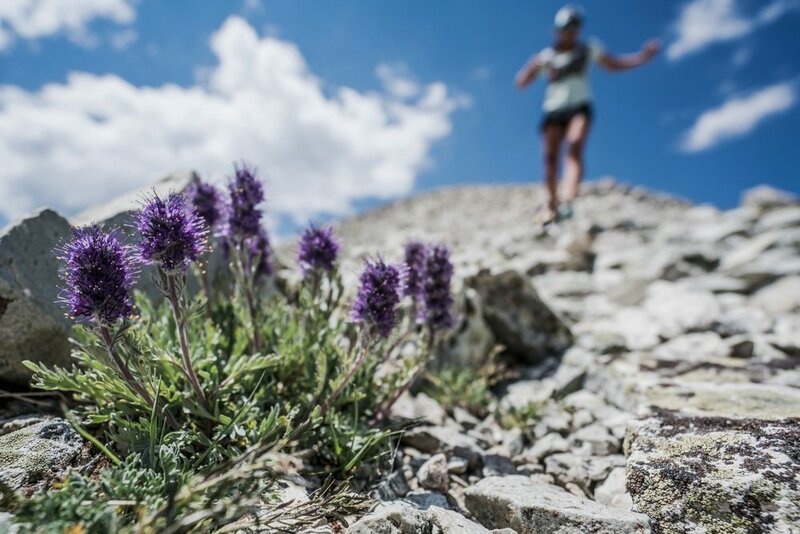 It is a very high altitude race, ranging from just under 10,000 feet/3,048 meters up to just under 14,000 feet/4,267 meters. You will be on trail, off-trail, through rivers, on boulder fields, through grass, you name it! What is a self-supported race? Self-supported means you will carry everything except water and the tent for the entirety of the race. There are no drop bags, the aid stations have only water and medical support, and you cannot accept anything from anyone at any point during the race. We do provide a list of mandatory and recommended gear so you know what to bring! There is nothing like the high Rocky Mountains! This part of the world is absolutely breathtaking. The mountains in this area are enormous and extensive, and include many of the highest peaks in the Rocky Mountains, including Mount Elbert. Mount Elbert is Colorado’s 14,433-foot iconic peak that serves as the highest point in the state and the second-highest in the contiguous United States. The mountains here are high, massive, imposing and beautiful, yet relatively gentle in contour. The town of Leadville itself, or "Cloud City USA," is the highest incorporated city in the United States, at 10,200 feet! A former silver and gold mining town lying near the headwaters of the Arkansas River in the heart of the Rocky Mountains, the Leadville Historic District contains many structures and sites from its dynamic mining era. Once one of the West's most lawless towns, Leadville overflowed with fortune-seeking miners, infamous outlaws and brawny mountain men. Wealthy businessman Horace Tabor and his wife Baby Doe, Margaret Brown aka "The Unsinkable Molly Brown," and gun-slinging Doc Holliday are just a few frontier characters who contributed to the town’s history. Leadville’s National Landmark District includes 70 square blocks lined with Victorian-era buildings, even including what was long the largest opera house West of the Mississippi--the Tabor Opera House. Today, Leadville is well-known for the remaining wooden mining structures of the 1800s, the Victorian era homes, and the endless outdoor opportunities. Leadville is surrounded on all sides by mountains, and located at the foot of Colorado’s two highest peaks, both over 14,000 feet – Mt. Elbert and Mt. Massive. Thanks to a wealth of pristine waters Lake County is an angler’s dream. The Arkansas River, with its Gold Medal waters designation, is known as one of the best wild brown habitats in Colorado. Even the golf balls fly further up in the thin air on the highest golf course in the USA! Leadville is one of America’s last remaining authentic mining towns. Is there a medal at the end? Better than that, there is a locally made, high quality Cloud City Multi-Stage belt buckle for every finisher. Additionally, there is a Badassery belt buckle for the Badassery Hill Climb winner, and there are awards for women’s and men’s age group winners, as well as for team winners. Do I have to be able to run the whole thing? Nope! Very few people will be able to run the whole thing. For most it will be a combination of running and hiking. Some will hike the whole thing. Some will be experienced ultra runners, others will never have even completed a marathon. For most, this is not a race--it is an adventurous challenge! Yes. Each Checkpoint has a cutoff time. The cutoffs are generous, and are there only for safety. We don’t want competitors who are too sick or injured to continue, and we don’t want competitors out in the dark except on the long stage when we are set up to support a night race. Is there wildlife out there? You will be out in open wilderness throughout the event, and wilderness is where wildlife lives, so you do need to be aware of potential encounters. There are rattlesnakes, black bear, mountain lions, moose, and other animals in the area. They are likely to be just as scared of you as you are of them! We do provide advice on how to respond to these and other potential encounters as part of the medical briefing. Yes. The entire course is marked with flags, ties, glow-in-the-dark sticks, and the like. From any marker, you can see at least the next marker; often you can see several markers ahead. Additionally, anywhere there is a sharp change of course or a situation where it might be easy to miss a turn, we add numerous markers to make it clear. We do suggest you have a basic familiarity with a compass in case you manage to go off-course, but if you are paying attention, you should have no trouble following the markers the whole way. You sure can! In fact, if you enter as a team, we’ll take $100 off each of your entries! A team is 3 or more people. Teams do not have to be together at all times during the race. You figure out the best way for your team—supporting each other step by step or running your own paces and meeting up at each day’s end. The team time is the time of the last team member over the line each day. If someone drops from your team, the team portion is over for you, but remaining members can continue on as individual competitors. How are tent mates determined? We will put 8 people together in 10 person tents. If there are people you specifically want to share with, you can let us know. If you have other requests (for example, if you don’t speak English so would prefer to be with others who speak your language) let us know and we’ll see if we can accommodate. If you don’t know anyone and don’t have preferences don’t worry—most people won’t. And really—it’s kind of fun when you just show up and see what random people you’ve landed with! We will mix up nationalities, genders, ages, expected finish times. What happens if (not that I will) I DNF? DNF is part of life with ultras, so while we hope it doesn’t happen to you, here’s how it works if it does: you are driven into Leadville, where we have a representative who will take you to collect your suitcase and who will secure you a hotel room. We do not pay for this room—you are responsible for your own hotel. You can either head out of town or you can explore the beautiful Leadville area until the Awards Dinner after the race is complete. We hope you will stay! Your room is still paid for by us for the night of the Awards Dinner. Definitely! We have top notch medical care available at camp every morning and night for concerns which come up. We also have medical care at every checkpoint (approximately every 10km). Our medical care is conducted by a group of practitioners who focus solely on backcountry emergency medical care. Additionally we have Search and Rescue and Flight Evacuation at the ready in the highly unlikely event you need them. Now, it’s also important to understand this is a very strenuous race in varied conditions in the wilderness. There can never be guarantees for safety in races or in life, and you need to make your own safety your first priority. Your family and friends can be on the finish line the final day to cheer you in and they are welcome to attend the awards dinner (additional fee for guests). Most, however, will not have family there. Family cannot be on the course anywhere except the finish line. Part of what makes this experience so special is being totally disconnected. Disconnected from electronics, your phone, your job, even your family. It’s just you, the race, the mountains, and your fellow competitors. It’s a pretty fabulous change from everyday life and you’re likely to find yourself creating lifelong friendships with competitors from around the globe through this intense experience. Can I stay in touch with my family and friends? We will have a Media Tent with computers, and you can send one email nightly as well as receive emails nightly. Your friends and family will also be able to follow along with daily results, photos, and updates on the web site and social media. What is included in the race fee? Top notch medical support for the duration of the race. Campfire when allowed, or propane tanks when not (depends on fire restrictions) each morning and evening to heat water for meal preparation. Denver International Airport is a major U.S. airport, and is less than 2 hours from Leadville. We will arrange shuttle buses from the airport to Leadville for an additional fee. Let us know if you are interested in this option so we know how many to arrange. We'll provide more information on this once you are registered. Generally we do not allow competitors under 18 years old, although an exception is possible on a case-by-case basis. There is no upper limit. 90 is the new 70 or something like that! We require a physician to sign off on your participation in the race, and a medical form to be completed no sooner than 3 months before race date. We will provide this form 3 months before race date. Competitors sleep in 10-man tents with 7 other competitors. The camp is set up before the first competitor arrives each day. You will be with the same people each night. Camp sites will have spectacular alpine views and beautiful stargazing on clear nights, the tranquility often broken only by occasional barks of coyotes in the distance. Do you have a charity component? Yes! This is a very important element for us. We partner with a local senior citizen charity to help alleviate loneliness in the elderly. Loneliness is becoming more and more rampant and is an issue very close to our hearts from the personal experience of our own relatives far away. In addition, we donate to local land preservation trusts or entities in each area in which we hold a race. We want others to be able to enjoy the beautiful lands we are lucky enough to enjoy. See the "About" section for more information. What if I want to raise money for my own charity? We love that! We don’t all need to support the same causes—as long as we each choose something important to ourselves, we all win! If you are raising money for a charity, let us know for a spotlight profile on our social media pages! Is this race a qualifier for UTMB/do you award itra points? Yes and Yes! ITRA has awarded 5 points for completion of this race. Use them toward UTMB or any other race needing qualifying points!